A bit of a catch up in the garden. I've not had a lot to say about it this year, the weather is o.k. and most plants are doing what might be expected of them but I've made poor planting selections, things are a bit stunted from lack of water and food and the continuing attacks by deer are dispiriting so there's not a lot to be enthusiastic about. 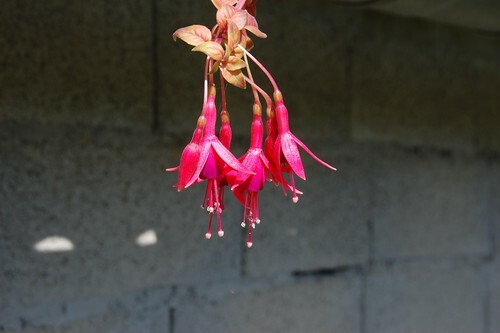 The fuchsia is one of a trio I bought in the spring in an attempt to brighten the place up a bit with some container planting but this one, Autumnale, seems frightfully tender and I had to take it back into the greenhouse early in the season as it looked as if it was about to die. It didn't and has hung on to make some flowers but I fear it won't overwinter in my care. Pity. 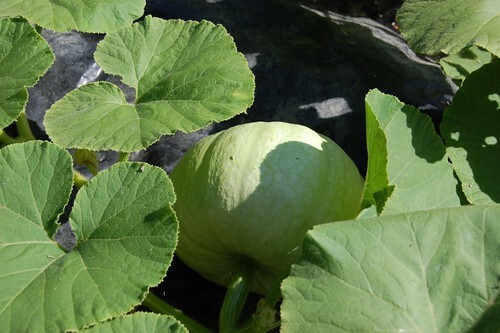 The last plant from the last seed of the Whangaparaoa Crown pumpkins I had such hopes for a while back. I'm not really sure what happened to find myself with just this single survivor of my seed saving but at least it has a couple of fruits; it's not all lost yet. I am a bit worried about the mottled and slightly pitted skin texture and hoping it's a function of physiological stress as it doesn't seem quite right for the variety. Yacon were new to me this year but I was expecting them to be bigger by now. The three plants look well enough, if a little dry but are still only 50cms high. 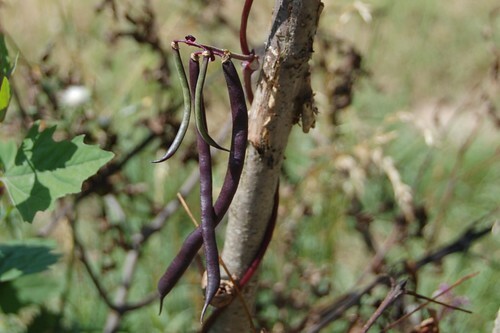 Some of the very few beans that survived (so far) the depredations of the deer. 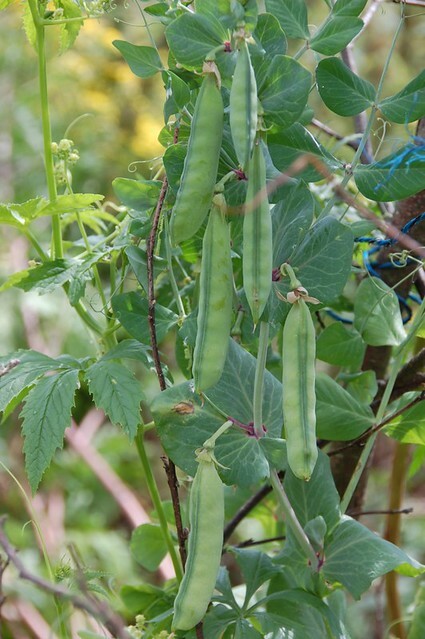 These are (I think) Cosse Violette and will probably be eaten rather than saved for seed since it's a widely available variety but they're not going to make much of a meal. In a different, more protected, part of the garden are the Irish Preans and I am hoping to have enough of these to have a few for swaps this year which will be nice after several seasons with nothing to offer. 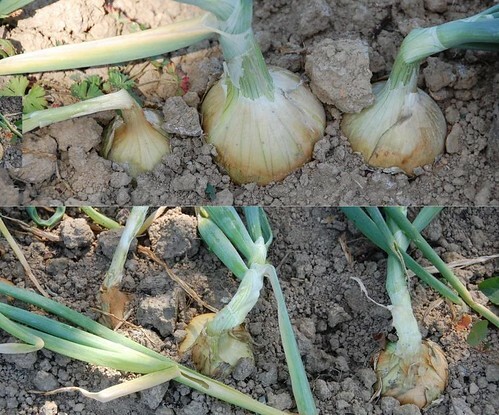 Onions have been, like the shallots, more successful than most things this year. Two varieties, both planted as sets and looking good. I love the flat bulbs of the Stuttgart and I'm not sure why I bought the F1 variety Santero other than an insatiable need for novelty. It looks from the picture as if the round bulbed Santero are bigger than the others but that's just bad photography. The Santero may be prettier for the show bench but seem to have little benefit for my purposes. Blueberry Herbert. 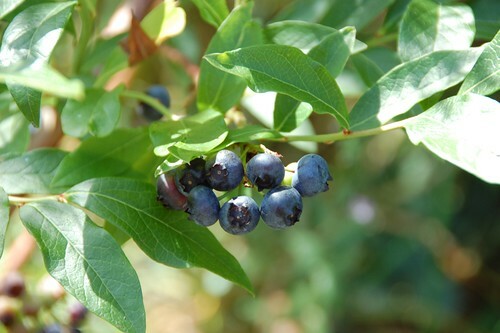 I've become a convert to home grown blueberries and bought this plant of Herbert to extend the season of my unnamed original plant which usually fruits in late July. 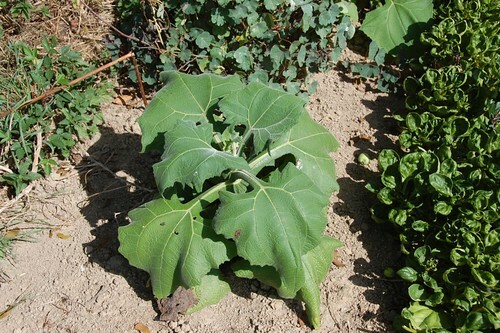 In fact the two plants have fruited at almost the same time this year so I'm now looking for much later and earlier varieties to supplement them.